I have tried everything, but have no contact with the card. Could it be important that I have cpap with European software? (02-22-2015, 06:56 AM)Jack_Russell_Fan Wrote: For those of you having connectivity problems, please download and install the newest version 2.0.1.21 from sleepmaster.org. It may resolve some of the issues. Thanks everybody who has helped. I have downloaded 2.0.1.21 and still have issues, but I have made progress. Hope you guys can get me over the top. I have connected my card to my network. It was assigned it's own IP address. When I click Settings->Wireless Networking Options, all I see is "If you would like to connect to a wireless network after this program ends, enter the SSID below. Otherwise leave it blank". This does not connect my card. When I look at the home screen, I notice numbers in the IP box that are not the cards IP address and I cannot change it. It does indicate that the program is in station mode. Any ideas? I have done the step by step instructions given to me here. (02-26-2015, 11:09 AM)cholo Wrote: When I click Settings->Wireless Networking Options, all I see is "If you would like to connect to a wireless network after this program ends, enter the SSID below. Otherwise leave it blank". This does not connect my card. I have tried both ways. have left it blank and I have entered my SSID. Nothing happens either way. Also, the Sleep Master software does find the flashcard but does not connect to it. (02-26-2015, 04:26 PM)on the virge Wrote: What do you do when you see this? to the Flashair card. It is to reconnect to your network after Sleep Master closes, if you desire to do so! Make sure you have entered the correct XPAP machine type. You might need to redo setup for the user. (02-26-2015, 06:14 PM)cholo Wrote: I have tried both ways. have left it blank and I have entered my SSID. Nothing happens either way. Thanks for your reply. I did understand what this meant, not sure why it was brought up. I have redone the set up and still no connection in station mode. I can connect in access point mode. My card is model number: SD-R008GR7AL01, could this be the problem? I have the setting set to SRS1. Is this OK for my Respironics 60 series? Did you check to see whether MAC Address Filtering was engaged on your router? When you disconnect from your computer and access the Wifi card, I believe it is because you are seeing it as an access point as would any other wifi computer. In that case you are not going through your router. MAC address filtering operates to keep anyone from accessing your router even if they know the SSID and password unless their MAC address is listed in the router. I bring this up again because I had the same problem when I first installed Sleep Master; I wasn't able to find a MAC address. It's on the back of the card. 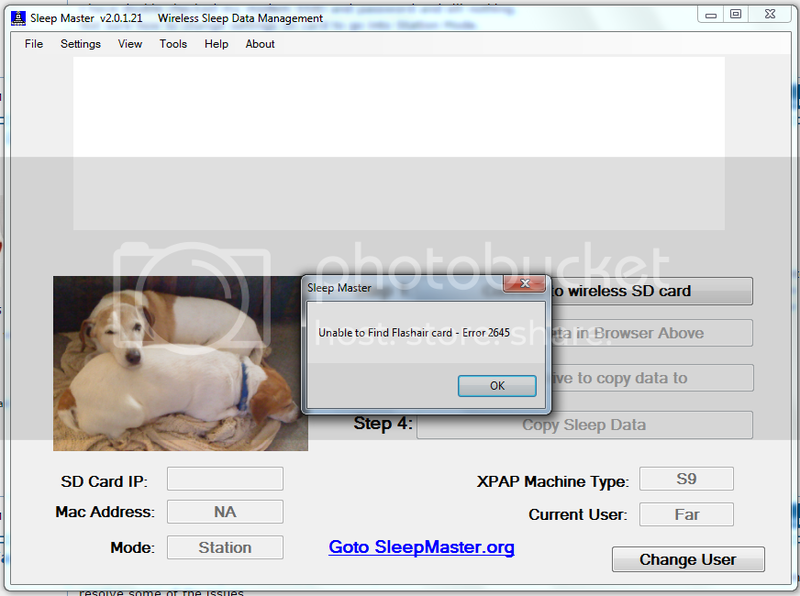 (02-26-2015, 06:42 PM)cholo Wrote: Also, the Sleep Master software does find the flashcard but does not connect to it. Your Flashair is one of the compatible models, and your XPAP machine settings are correct, if you meant PRS1! What is the distance between the Flashair in your XPAP and your router? My router is about 15 Ft. from my XPAP.